Almost once in a week, it’s in the news that US-led coalition jets flew to attack ISIS positions, but mistakenly bombed their foes in a so-called friendly airstrike. Each time, the lack of information or dis-coordination between forces is to blame, which is obviously a childish lie. With so many boots on the ground, and so many drones and satellites, they have up-to-the-minute information about battlefields. Reportedly, the US-led coalition has 180 warplanes there, which make only about 20 combat sorties per day. The rate of combat sorties to warplanes is 10% of what Russians are doing in Syria. this means that they have lots of excess time to double check everything before any operation. If the volume of operations was 100 times more than this, one or two isolated incidents could be ignored and forgiven. But what the US-led coalition is doing follows a repetitive pattern, indicating that these incidents can neither be counted as mistakes, nor friendly. The US does not want the fight against ISIS to end that fast, and they are helping the terrorists to keep their positions. That’s why the liberation of Mosul missed its deadline. Here I am going to list some of the most recent incidents, which were reported by many News agencies, and they are easily verifiable. On Saturday, U.S. airplanes attacked the most important Syrian government position in Jabal Tharda, Deir Ezzor. Nearly a hundred Syrian soldiers were killed and most of the heavy equipment the Deir Ezzor garrison had left was destroyed. Immediately after the attack fighters of the Islamic State occupied the bombed out government positions and the heights above the Deir Ezzor airport. 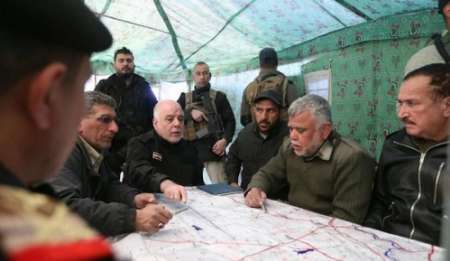 Popular Mobilization Units (PMU) reported that on Friday night, Prime Minister Al-Ebadi and Army leadership had a meeting in a tent in Tel-Afar airport, which was liberated by PMU days ago. US-led coalition fighter jets targeted that tent with a missile, but fortunately it hit the tent when the meeting was over and all the attendees left that place. There was no other fighter jet in Iraqi skies, other than the coalition jets, at the time. The coalition’s air force bombed the so-called “Golden Division” of the Iraqi army near the Mashfa al-Salam hospital that Iraqi fighters had seized from ISIS. As a result of airstrikes and ISIS counter-attacks Iraqi security forces (ISF) lost up to 200 fighters and was pushed to retreat. 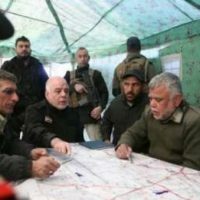 90 Iraqi military servicemen were killed and 100 wounded as result of a US airstrike in Mosul, the Iraqi Fact-in-iraq news portal reported. The airstrike destroyed eight infantry fighting vehicles and four Humvee military light trucks belonging to ISF and pushed ISF to retreat from the recently liberated areas of the ISIS stronghold. The Islamic State’s (IS) ‘Amaq News Agency reported that in Al-sehha district in Sout-east Mosul, the colaition jets bombed Iraqi Army positions. This one still is not confirmed by other outlets. IRNA reported that Dr. Ahmed Raid al-Hamadani, Mosul operations’ mobile hospitals unit official, stated: “As far as we have learnt from eyewitnesses, a civilian convey of 10 vehicles was targeted by coalition forces in eastern part of Mosul, where Daesh has no connection.”. He added that at least 15 people were killed in the attack. Also in a separate operation, coalition planes also hit Ibn al-Haysum, a civilian residential neighborhood in southeastern Mosul, killing 12 civilians, including women and children. Farsnews reported that Iraq’s Shafaq News website said at least 14 members of three families were killed on Saturday; after US-led warplanes targeted a car loaded with explosives in al-Nabi Shiet district of Eastern Mosul. Last night the U.S. military hit a mosque in Al-Jīnah in Aleppo governate in Syria. It first claimed that the strike, allegedly targeting a large meeting of al-Qaeda, was in Idleb governate. But it turned out to be miles away west of Aleppo. Locals said a mosque was hit, the roof crashed in and more than 50 people were killed during the regular prayer service. More than 120 were injured. The U.S. military said it did not hit the local mosque but a building on the other side of the small plaza. Their claim is misleading, because a new bigger mosque had been build some years ago opposite of the old mosque. The old mosque was indeed not hit. The new one was destroyed while some 200 people were in attendance. Eight hell-fire missiles launched from two Reaper drones were fired at it and a 500lb bomb was then dropped on top to make sure that no one escaped alive. Personally, I have never seen such a practice condoned in any “Rules of Engagement” document anywhere in the world. Bombing 200 civilians, just because a few Al-Qaeda fighters attending there, is not justified. PressTV reported that a large number of people were buried under rubble in Mosul after the US-led coalition’s airstrike targeted a western neighborhood there. The United Nations said it was “stunned by the horrendous loss of life” in the aerial attacks which reportedly killed more than 200 people in Daesh-held Mosul which is on the brink of being recaptured by Iraqi troops.